An al-Qaeda affiliated terrorist "ringleader" responsible for the killings and kidnappings of several foreigners and a daring prison raid was killed in in Yemen on Wednesday, officials said. "Today, the government of Yemen announced the death of Wael al-Waeli, a terrorist ringleader (linked to al-Qaeda in the Arabian Peninsula) who planned and executed a number of criminal operations," read a statement from the Yemen Embassy in Washington, D.C."
"The assassination of a French national working for the EU mission in Yemen; The (June, 2013) kidnapping of Dutch journalist Judith Spiegel and her spouse and the attempt to kidnap two foreign nationals at a local barber shop; The attempted assassination of a German diplomat (And) a recent (Feb. 2014) attack on Sanaa's central prison that lead to the freeing of over a dozen AQAP militants." Security forces in the country also detained five other al-Qaeda suspects and captured weapons in raids across the capital, the state news agency reported. 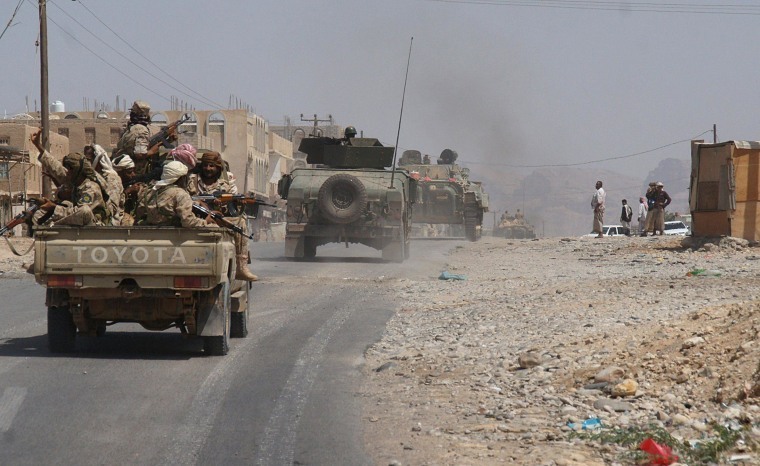 The announcements came as Yemeni forces pushed ahead with an offensive against al Qaeda in the Arabian Peninsula, or AQAP, and its local offshoot, Ansar al-Sharia, having captured the militants' main stronghold in the south on Tuesday. Yemeni authorities accuse AQAP of involvement in dozens of attacks around the country, including a wave of assassinations of senior army and intelligence officers in drive-by shootings. In their statement, the Yemeni government also denied allegations that they are negotiating with the local tribes to end confrontations with AQAP militants. "The government of Yemen is committed to continuing the fight to eradicate AQAP and its local affiliates," the statement read. Also on Wednesday, the United States suspended operations of its embassy in Sanaa to the public. "We continue to evaluate the security situation every day, and we will reopen the embassy to the public once it is deemed appropriate," State Department spokeswoman Jen Psaki said in a statement, describing it as a "precautionary step."